San Francisco is known for nature, museums, parks, nightlife, and shopping. Your plan includes some of its best attractions: snap pictures at Golden Gate Bridge, catch a ride on Cable Cars, take in the waterfront at Fisherman's Wharf, and get to know the fascinating history of Filbert Steps. To see maps, where to stay, ratings, and tourist information, you can read our San Francisco day trip planner. New Delhi, India to San Francisco is an approximately 19.5-hour flight. You can also do a combination of train and flight; or do a combination of train, taxi, and flight. The time zone difference moving from India Standard Time (IST) to Pacific Standard Time (PST) is minus 13 hours. When traveling from New Delhi in November, plan for slightly colder days and about the same nights in San Francisco: temperatures range from 20°C by day to 12°C at night. Cap off your sightseeing on the 6th (Tue) early enough to travel to Las Vegas. Go for a jaunt from Las Vegas to Boulder City to see Hoover Dam about 50 minutes away. The adventure continues: ponder the design of Bellagio Fountains, try your luck at Bellagio Hotel and Casino, shop like a local with The Strip, and take in nature's colorful creations at Bellagio Conservatory & Botanical Gardens. For traveler tips, more things to do, ratings, and other tourist information, refer to the Las Vegas itinerary planner. Fly from San Francisco to Las Vegas in 4 hours. Alternatively, you can do a combination of subway and flight; or drive. In November, plan for daily highs up to 23°C, and evening lows to 9°C. Wrap up your sightseeing on the 9th (Fri) to allow time to travel to Grand Canyon National Park. On the 11th (Sun), hike the day away at Bright Angel Trail. Spend the 13th (Tue) exploring nature at Grand Canyon National Park. There's lots more to do: take in breathtaking views at Grand Canyon South Rim, take some stellar pictures from Lookout Studio, trek along North Kaibab Trail, and pause for some photo ops at Powell Point. For where to stay, more things to do, other places to visit, and other tourist information, read Grand Canyon National Park day trip app . You can do a combination of car and flight from Las Vegas to Grand Canyon National Park in 4.5 hours. Other options are to drive; or take a shuttle. Due to the time zone difference, you'll lose 1 hour traveling from Las Vegas to Grand Canyon National Park. Traveling from Las Vegas in November, expect nights in Grand Canyon National Park to be colder, around -6°C, while days are little chillier, around 14°C. Cap off your sightseeing on the 14th (Wed) early enough to travel to Dallas. Kick off your visit on the 15th (Thu): contemplate the long history of Top O'Hill Terrace and then take in nature's colorful creations at Dallas Arboretum & Botanical Gardens. To see where to stay, ratings, other places to visit, and more tourist information, go to the Dallas journey maker tool . Getting from Grand Canyon National Park to Dallas by combination of bus and flight takes about 8 hours. Other options: drive. The time zone difference when traveling from Grand Canyon National Park to Dallas is 1 hour. Traveling from Grand Canyon National Park in November, expect nights in Dallas to be much hotter, around 11°C, while days are a bit warmer, around 22°C. Wrap up your sightseeing on the 15th (Thu) early enough to travel to Atlanta. Start off your visit on the 16th (Fri): admire nature's wide array of creatures at Georgia Aquarium and then let your taste buds guide you at a local gastronomic tour. For maps, other places to visit, traveler tips, and more tourist information, refer to the Atlanta road trip planner. You can fly from Dallas to Atlanta in 4.5 hours. Alternatively, you can drive; or take a bus. The time zone changes from Central Standard Time to Eastern Standard Time, which is usually a 1 hour difference. Plan for little chillier nights when traveling from Dallas in November since evenings lows in Atlanta dip to 7°C. Cap off your sightseeing on the 16th (Fri) early enough to travel to Columbia. On the 17th (Sat), pick up some local products at Soda City, tour the pleasant surroundings at Irmo Town Park, and then test your problem-solving skills at popular escape rooms. For traveler tips, photos, other places to visit, and other tourist information, read our Columbia journey planner . Traveling by flight from Atlanta to Columbia takes 2.5 hours. Alternatively, you can drive; or take a bus. In November, daily temperatures in Columbia can reach 22°C, while at night they dip to 7°C. Wrap up your sightseeing on the 17th (Sat) to allow time to travel to Chicago. Take a break from Chicago with a short trip to Bengtson's Pumpkin Farm in Homer Glen, about 42 minutes away. Next up on the itinerary: admire the masterpieces at The Art Institute of Chicago, admire all the interesting features of Wrigley Field, appreciate the extensive heritage of Millennium Park, and meet the residents at Lincoln Park Zoo. For where to stay, ratings, and more tourist information, use the Chicago online trip planner . You can fly from Columbia to Chicago in 4 hours. Other options are to drive; or take a bus. You'll gain 1 hour traveling from Columbia to Chicago due to the time zone difference. In November, Chicago is little chillier than Columbia - with highs of 11°C and lows of 1°C. Finish your sightseeing early on the 20th (Tue) so you can travel to Fort Wayne. Fort Wayne is a city in the U.S. Kick off your visit on the 21st (Wed): browse the collection at Allen County Public Library, test your problem-solving skills at Room to Escape, then see the interesting displays at Auburn Cord Duesenberg Automobile Museum, and finally relax in the rural setting at Salomon Farm Park. To see ratings, reviews, maps, and tourist information, use the Fort Wayne travel itinerary planner. Fly from Chicago to Fort Wayne in 3 hours. Alternatively, you can drive; or take a bus. The time zone changes from Central Standard Time to Eastern Standard Time, which is usually a 1 hour difference. In November, plan for daily highs up to 11°C, and evening lows to 0°C. Finish your sightseeing early on the 21st (Wed) to allow enough time to travel to Detroit. Kick off your visit on the 22nd (Thu): admire the masterpieces at Detroit Institute of Arts, then examine the collection at The Henry Ford, then examine the collection at Greenfield Village, and finally explore and take pictures at Comerica Park. To find maps, more things to do, reviews, and other tourist information, go to the Detroit online vacation planner . You can do a combination of flight and bus from Fort Wayne to Detroit in 3 hours. Alternatively, you can drive; or take a bus. In November in Detroit, expect temperatures between 10°C during the day and 1°C at night. Wrap up your sightseeing on the 22nd (Thu) to allow time to travel to Pittsburgh. Kick off your visit on the 23rd (Fri): explore and take pictures at Phipps Conservatory and Botanical Gardens, take in the architecture and atmosphere at St Paul Cathedral, then examine the collection at Bicycle Heaven, and finally admire all the interesting features of PNC Park. For where to stay, more things to do, reviews, and tourist information, go to the Pittsburgh trip website . Traveling by flight from Detroit to Pittsburgh takes 4.5 hours. Alternatively, you can drive; or take a bus. In November in Pittsburgh, expect temperatures between 13°C during the day and 1°C at night. Finish your sightseeing early on the 23rd (Fri) so you can travel to Arlington. Kick off your visit on the 24th (Sat): tour the pleasant surroundings at Gravelly Point Park, contemplate the long history of Arlington National Cemetery, and then appreciate the extensive heritage of Tomb of the Unknowns. To find other places to visit, more things to do, maps, and tourist information, you can read our Arlington travel planning tool . Do a combination of flight and subway from Pittsburgh to Arlington in 3.5 hours. Alternatively, you can do a combination of flight, bus, and subway; or drive. Plan for somewhat warmer temperatures traveling from Pittsburgh in November, with highs in Arlington at 17°C and lows at 6°C. Finish up your sightseeing early on the 24th (Sat) so you can go by car to Washington DC. Washington DC is known for museums, historic sites, nightlife, zoos & aquariums, and fun & games. 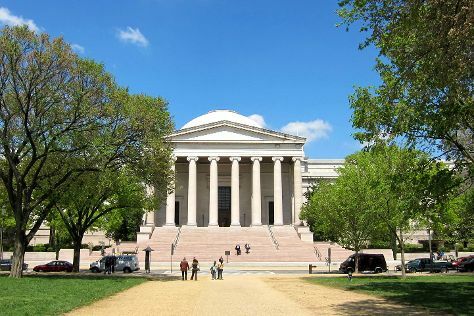 Your plan includes some of its best attractions: admire the masterpieces at National Gallery of Art, explore the activities along Tidal Basin, appreciate the history behind Vietnam Veterans Memorial, and get a sense of history and politics at White House. For where to stay, other places to visit, reviews, and tourist information, use the Washington DC sightseeing planning app . Washington DC is very close to Arlington. In November, daytime highs in Washington DC are 17°C, while nighttime lows are 6°C. Finish your sightseeing early on the 27th (Tue) so you can take a train to Philadelphia. Start off your visit on the 28th (Wed): hunt for treasures at Reading Terminal Market, admire the masterpieces at Philadelphia Museum of Art, and then tour the pleasant surroundings at Wissahickon Valley Park. To find photos, maps, ratings, and more tourist information, refer to the Philadelphia road trip planner. You can take a train from Washington DC to Philadelphia in 2 hours. Other options are to drive; or take a bus. Expect a daytime high around 16°C in November, and nighttime lows around 5°C. Wrap up your sightseeing on the 28th (Wed) early enough to take a bus to New York City. New York City is known for museums, nightlife, shopping, historic sites, and parks. Your plan includes some of its best attractions: take in the pleasant sights at Central Park, pause for some serene contemplation at St. Patrick's Cathedral, appreciate the history behind Statue of Liberty National Monument, and contemplate the long history of 9/11 Memorial. To see other places to visit, reviews, more things to do, and more tourist information, read our New York City day trip planning tool . Getting from Philadelphia to New York City by bus takes about 1.5 hours. Other options: take a train; or drive. In November, daily temperatures in New York City can reach 16°C, while at night they dip to 7°C. Finish up your sightseeing early on the 2nd (Sun) so you can travel back home.